The village has a long history stretching back to Roman times and is also thought to have been the site of the Battle of Willoughby Field, during the Civil War in 1648. It is even mentioned in the Domesday Book. Please click here to view a collection of historical articles & here to view historical photographs of Willoughby. The following PDF documents were compiled by the late Brian Thornally, a long-time resident of Willoughby. His main sources were The Henry Rowlinson Collection (now housed at Nottinghamshire Archives Office) & The History of Willoughby on the Wolds by Heather Hamilton (Nottingham Univ. 1970). 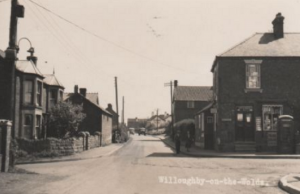 You can also view press clippings and other historical village documents here or read more on the history of Willoughby here. 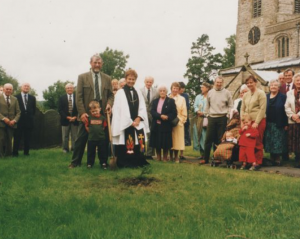 On Sunday 17th September 2000, after the Harvest festival Service, a ‘Yew for the Millennium’ was planted in St. Mary and All Saints Church yard. This tiny plant was propagated from the Buxted Yew, East Sussex. as were very many others made available to all Parishes in the Country by The Conservation Foundation. The Buxted Yew is estimated to be at least 2000 years old, and can be found about half way between Brighton and Tunbridge Wells. The Willoughby Yew was planted, under Revd. Christine Turner’s supervision and Blessing, by Brian Thornalley and his grandson Joshua, and was witnessed by the congregation attending the Harvest Festival. Contrary to modern associations (eg. graveyards), in ancient times the yew tree (taxus baccata) was known as ‘the tree of life’, mainly for its unfailing ability to regenerate after severe pruning and lopping. At a later date, the tree was moved to a site on the west side of the Church, at the request of a close neighbour.